The view from my bedroom in Tsukuba, May 2010. 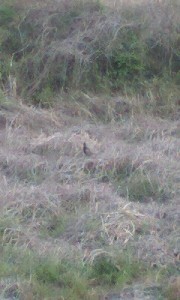 Can you spot the pheasant? You might be surprised to hear that of all the many living creatures dwelling in the vicinity of my home here in Tsukuba`s last remaining lowland wilds, the one which has given me the most heart-stopping FRIGHTS ( besides the humans! ), is the one which adorns the back-side of Japan`s Ten-Thousand Yen notes- the Japanese National Bird, yes, the KIJI (雉), or as we say in English, the pheasant. How is it that these birds have so often gotten me to stop short in my tracks gasping, leaving me to catch my breath and STILL my fast-beating heart with my hand pressed against my chest. Well, let me tell you. Unlike other more nervous birds, such as egrets, which in Tsukuba usually take flight if you stop and look at them even from a distance of more than 100 meters, the pheasants, which are abundant in the fields around my house JUST SIT TIGHT when danger approaches and try to stay out of sight. That means that I can be out walking in the wilds, with not another soul in sight, with only the sound of the birds, the wind, and the crunching of the vegetation under my feet, when suddenly right from the spot upon which I am about to make my next step- KENKENKENKENKENKENKENKENKEN !- an explosive burst of sound- a high pitch cry accompanied by a crazed flapping of wings.The first time I experienced this pheasant SURPRISE, I nearly soiled my briefs, as I watched the relatively large bird soar away to safety. Still each time it happens it scares me stiff. 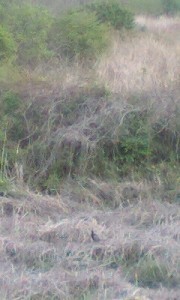 My noisy neighbor- can you see him? 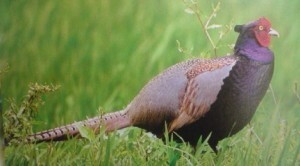 Pheasants also react vocally to earthquakes, even the slightest tremors. If I am outside and suddenly hear the pheasants crying from every direction, I know that there must be a tremor ( or an earthquake) occuring that I cannot sense while Im outside ( though if I were in my rickety old house I would surely feel it!). 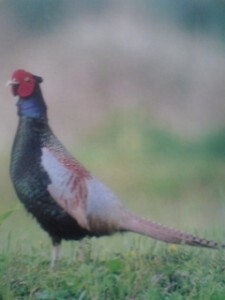 Some say that pheasants predict earthquakes, by I dont think it would be practical to use their call as a warning. That would mean running out of the house everytime you heard a group of them crying. This would be rediculous because their reaction is JUST before we can sense the earthquake, and they have the SAME reaction even to the slightest tremors ( which occur several times everyday). In the winter, hunters with shotguns and dogs, used to come to my neighborhood for pheasant every weekend. I was always amazed that no matter how many they shot, there would still be plenty in the fields the next week. I later learned that this was because these birds are actually BRED and RELEASED for the hunters. Dogs ( which the hunters often transported in the TRUNKS OF THEIR CARS! ), would scamper around and the pheasants would cry out as they tried to make their escapes. It is their cry which actually dooms them, alerting the hunters of their presence and location. The shotgun`s wide range of spray makes it easy to hit the large bird. For this reason the Japanese have a saying: KIJI MO NAKAZUBA UTAREMAI ( 雉も鳴かずば打たれまい), which literally means that the pheasant would not be shot if it didnt cry, and which is used when one wants to say- There is no-one to blame but yourself ( and your habits) for whatever bad happened has happenend to you. 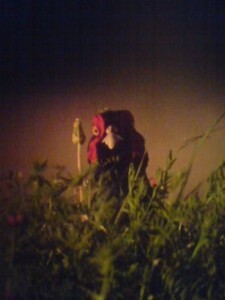 The KIJI has long been a favorite target for hunters, and it is mentioned as such in Japan`s oldest written text, The Kojiki. One of the best ANTI-HUNTING parables that I know of, is as old Japanese story which tells of a man, whose greatest pleasure in life had been the hunting of pheasant, with trained hawks and dogs. One night he dreams that he and his his family were suddenly transformed into pheasants and had become the target of his own hunting party. After much terrifying pursuit, his wife and children are ripped to shreds by the hawks and dogs . Overwhelmed by the sympathy brought on by a newfound understanding of the pheasants position, the man repents his ways and permanently ends his hunting career. 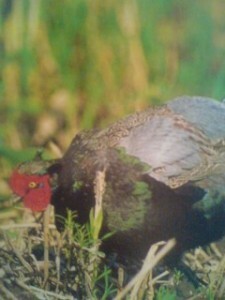 The pheasant has been greatly respected in Japan for it courage ( it is said to kill snakes), and for its fierce protectiveness of its young ( it is said that parent birds stay with their chicks during brushfires, prefering death to abandoning their brood). It is also curious ( and amazing) that the appearance of a mutant white pheasant ( hakuchi), was considered a momentous occassion in ancient times. In fact, in the year 650, the Era Name was changed ( appropriately to HAKUCHI), after one of these extremely rare birds was discovered . One of strangest and most startlling coincidences that I have ever had in my life was a few years back on the way to see a RAKUGO performance. I had bought a book about Japanese culture and was randomly flipping through it on the train. One thing that caught my eye was the story of the HAKUCHI. When I arrive at the theater ( which was actually an old restaurant),The Suzuki-Ya, my eyes almost popped out of my head when just inside the entranceway,stuffed and mounted in a glass case, stood a white pheasant- a HAKUCHI. Anyway, keep your ears open for the pheasant cries, and you might even be lucky enough to see one, slinking or darting though the brush. Theycan be hard to spot, but if you hear their call, stop and wait- for a while. the pheasant might reveal itself. In spring , I have seen males at a stand-off, right in the middle of the road, oblivious to traffic, so this time of year, the mating season will give you the best chance to spot them. 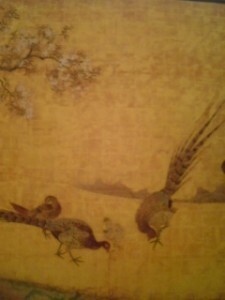 Have a pheasant- I mean pleasant, Golden Week!